Anti-bullying group Stand for the Silent is making big strides in bringing awareness to the issue, it seems. The national organization started in 2010, and since then three local chapters have cropped up and are finding different ways to connect with students, families, schools and the community. Cambridge Junior College was honored as the 2017 Business Partner of the Year Friday night at the Yuba-Sutter Chamber of Commerce 33rd Annual Awards Gala, one of several awards presented during the celebration at Colusa Casino Resort. The college, first established in Sutter County, was founded in 1999. Editor’s Note: This is the second of two parts on the Stand for the Silent program. Kirk Smalley is on a mission to end bullying – and he’s making progress both near and far. An online service is needed to view this article in its entirety. For a long time after her daughter’s suicide attempt, the idea of bullying sent Susie Cauchi into “Mama Bear” mode. 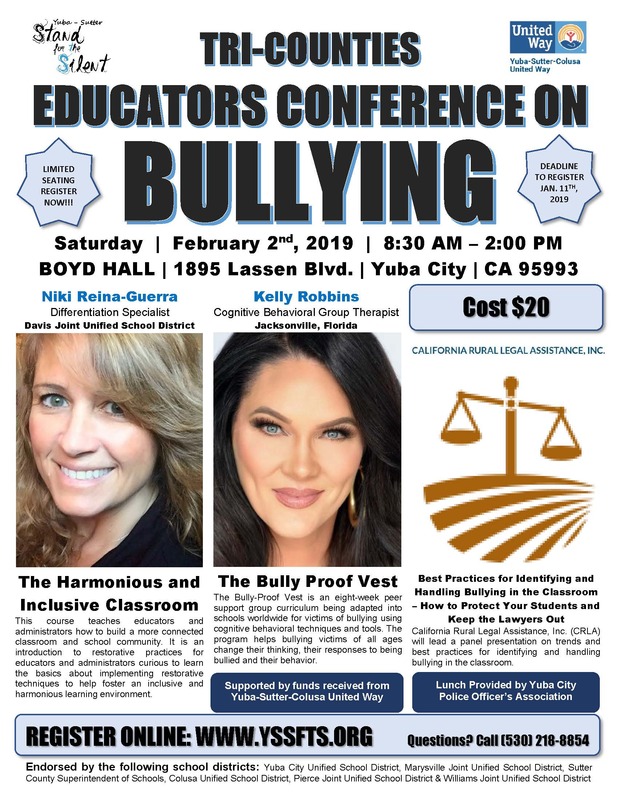 Legally, the school district could not do anything about the cyberbullying that happened off campus and during after-school hours, and without a restraining order, law enforcement could not do much to help. When many people hear the term bullying, they think of an issue that affects young students. Dr. Charles “Herb” Schiro, a recently retired psychiatrist with Harmony Health, initially thought the same but found that bullying is also prevalent in the senior citizen community. An online service is needed to view this article in its entirety. Help us provide bullying education, resources and support.